Having a hatchet or an axe in your camp can be a very useful piece of equipment to own. While primarily used to get firewood, it can also be great for other uses such clearing space for a camp. Choosing the best hatchet or the best axe for you though can depend on many factors. The difference in quality can vary largely from one company to the next, which makes it important that you’re fully aware of what you are buying. It also depends on your needs too as the length, weight and handle for example can all depend on what use you have for it and your personal preference. There are many other factors too but that’s where we can help as we have created a buying guide to give you all the knowledge that you will need. We have also completed axe and hatchet reviews on the best products on the market to leave you with a great idea on which one will be perfect for you. Husqvarna are a company that produce a wide range of brilliant hatches and axes and this hatchet is a great example of that. It’s a 13” hatchet which is great for light use where you will be able to cut branches and gather wood together for a small campfire. The product looks great too with its curved wooden handle and has a very traditional look to it. They also produce a composite model too for those looking for a more modern look. The head of the hatchet is attached to a hickory shaft with both a wooden and steel wedge for fastening. The hatchet also comes with a leather edge cover which will be able to give it an additional level of safety. 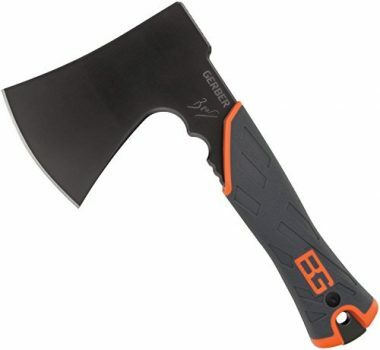 Overall this is a brilliant hatchet which is a top rated ax by those who have used it. It’s perfect for those smaller jobs or for someone looking for something a little more compact. In any product that you buy, it’s always a nice added benefit if it looks good and this is one of the most stylish products on the market which will look great with the rest of your gear. It’s also very highly reviewed too which lets you know that you will be getting a quality product and one which will last for a long time. Part of the style that it has comes from the fact that the head of the hatchet is forged in one piece which not only makes it look great but gives it an added level of durability. With it being 14 inches long, you won’t be able to get the power that others have but you’ll be easily able to get that firewood. This also comes with a durable cover too, with this one made out of a nylon sheath. The hatchet has a genuine leather grip which has been hand sanded and lacquered for a great finish which makes it durable but also comfortable to hold at the same time. 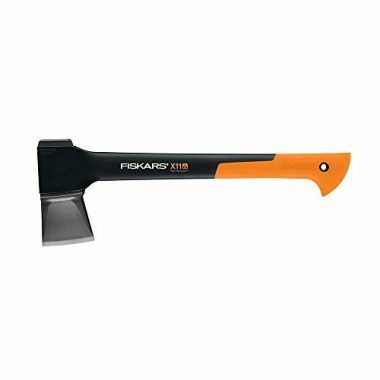 This hatchet from Fiskars has a much more modern design to it than the other products that we have featured so far. The reviews that the product has received though have been very positive which shows that this is a quality product which won’t let you down. At 14 inches this is going to be an ideal hatchet for cutting down small to medium sizes logs. It feels very well weighted in your hand as the hatchet is very well balanced with a brilliant power to weight ratio, and the weight will allow you to swing the blade at a high speed. It has a very sharp blade which will be able to give you a great level of contact with the wood and provide you with a very clean cut. The hatchet comes with a protective cover and it also comes with a lifetime warranty too so you know that you are going to be protected if there are any defects. This is a great backpacking hatchet with a modern design but one which has a different look to most other hatchets that are available to buy. It had a very short length but with a very wide blade which will be able to give you a high level of control. The product is under 10 inches long but that blade is 3.5 inches wide. That size will not only be able to give you more control for those precise cuts but you will also be able to swing the hatchet at great speeds and it makes it easily portable. The product is made out of high carbon steel which will be able to give you a high level of durability and allow you to use the hatchet for years to come. Around that steel is a rubber grip which will give you a secure hold, even in wet conditions. This survival axe has been approved by renowned survival expert Bear Grylls and has received a very good rating from those who have used it. The hatchet also comes with a mildew-resistant cover. This hatchet is back to a more traditional look with the wooden handle and the steel blade. A lot of people prefer this look for a more authentic experience and to appreciate the craftsmanship of the product. This hatchet is 13.5 inches long which is ideal for most camping jobs. It only weighs 1.3 pounds though so it’s a hatchet which you will be a swing at a great speed in order to improve the results that you are going to get from it. You will be able to easily carry it in your rucksack along with all the other items that you have with you. The hatchet is pinned at the top in the traditional style and there is an eyelet at the bottom of the product if you wanted to tie something through for a more secure hold. The handle is well-designed to stop it from slipping out of your hands and it comes with a leather sheath for safety. 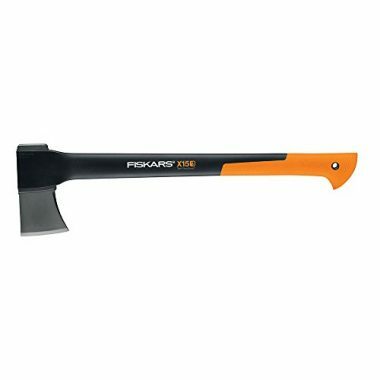 This is a highly effective axe from Fiskars which is able to split logs but is still small enough to be used with one hand with it being 17 inches in length. It’s designed in order to give you a maximum level of efficiency so you are able to split the wood with just the one strike. Like with all of the products from Fiskars, it strikes a perfect balance between power and weight which means to will feel great in your hands at all times. It also means that you will be able to swing the axe very quickly to give you an even more powerful strike. The modern axe comes with a lifetime warranty so you know that you will be able to have peace of mind that you are getting a quality product. That is added to by the fact that the product has received a string of great reviews. It also comes with a sheath which doubles up as a convenient carry handle. This is a much larger camp axe and therefore one which will be able to generate a lot more power throughout the swing. That power would have to be delivered with two hands and will be able to fell trees as well as chop further pieces of wood for making camp or keeping a fire burning. 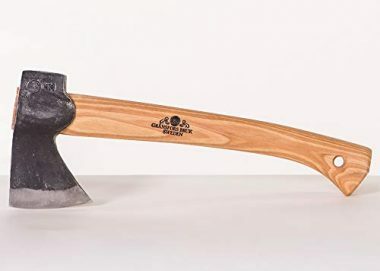 It’s a single-bit axe which comes in the more traditional style but Husqvarna also have composite axes available too for those who are looking for the more modern style. This axe has a head which is attached to a hickory shaft by using both a wooden and a steel wedge in order to secure the fastening. This is going to be an ideal axe for those who are looking for that additional level of power with their swing. Its size naturally makes it impractical to take on a backpacking mission but it’s ideal for taking to a more permanent camp where you are in constant need of firewood. This is backpacking axe which will be able to deliver a very high level of power as it’s another which is 26 inches long. The axe is forged from one piece of steel which will be able to give the axe a huge amount of strength and also durability so this is an axe which could last you for a lifetime. Its size will be able to give you a high level of versatility as you would be able to chop down trees with this axe but also logs as well as branches or splitting firewood. The axe comes with a heavy-duty nylon sheath which will be able to give you protection when it’s not in use. The axe is very easy to hold with its leather grip which has been hand sanded and lacquered to give you a durable and comfortable feel. This is an axe which has been very well crafted which means that it not only looks great but it will deliver a high level of performance too. 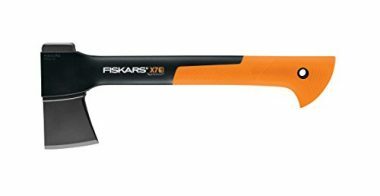 This is another product from Fiskars but one which is a lot longer and therefore able to do a lot more damage than the other products that we have shown from them. This axe is ideal for felling trees and clearing a camping area or it could be used simply for making firewood. The axe will be able to chop deeper with each swing of the blade which will be able to get the job done very quickly and make it mean that you don’t need to expend as much energy. The axe is well balanced which will allow you to freely swing the blade and create a great contact. The handle of the axe is made of composite materials which are lightweight and able to absorb any shock which might come through from the blade. It is also very strong too and perfectly complements the steel blade. A lifetime warranty is offered so you know you’re getting a quality product. 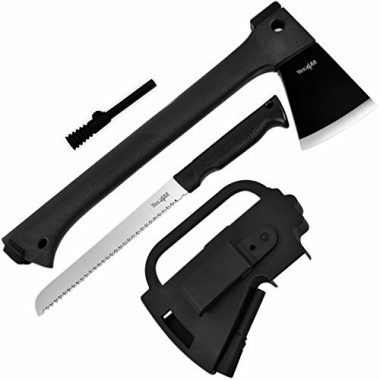 This is a great set from Yes4All which not only comes with a brilliant camping axe but it also comes with a brilliant 12-inch camping saw which is able to fit inside of the axe handle to be used whenever you need it. It also comes with a fire starter too which is a useful addition to your camping equipment. The axe itself has a very sharp blade which will be able to complete a number of different tasks. It is highly durable too and comes with a 3-inch cutting edge. The whole product is covered in a black metal paint which makes it look great to also provides corrosion resistance. The handle of the axe is non-slip and shaped in order to provide you with a consistently high level of control. It will give you grip even in wet conditions and is also very durable. A molded plastic case is offered to give you protection and also make it easy to carry. It’s important that you know what it is that you are planning to use your hatchet or axe for. The best products are going to be able to give you a number of different uses but it’s worth taking into account that a smaller product will give you more control and a larger one will give you less. 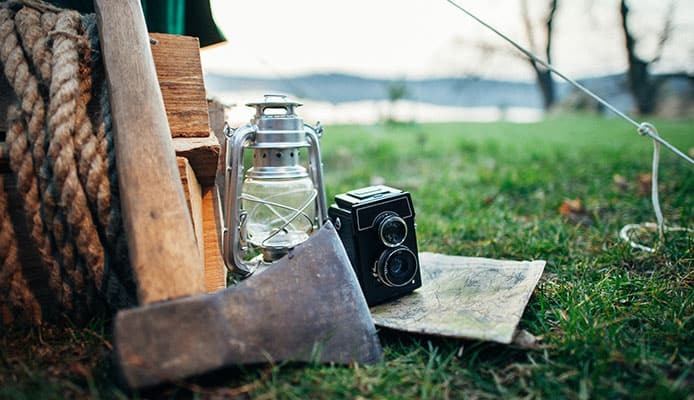 The primary use when it comes to these camping products is their ability to make firewood and this will generally be done by felling and splitting up trees, splitting logs or cutting off branches. In terms of this, it’s important to know just how big your campfire is going to be and therefore how big the wood needs to be for your fire. In terms of felling trees then you would need an axe in order to do that and if you need a lot of firewood over a sustained period of time then it makes sense to use an axe as their greater size will enable you to generate more power and therefore spend less effort to do it. For smaller camps, using a hatchet would be fine. Another use that can often be found for your sharp blade is to be able to clear a path for a camp. It’s going to be hard to find a new spot which is completely suitable for a camp so you often have to clear away trees and branches in order to make sure that you have a great space in which to camp. There are also other uses that you can have, like if you were planning to put up a camping hammock for example or it could be that you need to create some poles or stakes for your camp. They are a very useful tool to have and one which you could well find uses for that you initially didn’t even consider. It is important to know what the primary use that you’re going for your axe or hatchet is though as this will have a large bearing on what type of product that you are going to pick. Getting the wrong type could well mean that you aren’t going to be able to use it in the way that you were hoping too. When it comes to the power that you are going to be able to generate to your blade, length is going to be the most important factor and also generally what separates an axe from a hatchet as an axe will generally have a lot more length to it and therefore generate more force. With a longer blade you will be able to generate more momentum. Imagine trying to try and hit a home run with a 10-inch baseball bat, it wouldn’t be possible. The baseball bat analogy also works in terms of the control and weight too. Now imagine trying to hit a baseball with a 50-inch bat, it would be too heavy and hard to control. The force that you are able to exert depends on two things and that is the mass of the blade and the speed at which it lands. Having a longer handle means that you will be able to swing the blade at a much greater speed and therefore you’ll generate more force. This is important in determining which product is going to be the best for you and your situation. As we referred to before, there are three main drawbacks when it comes to having an axe with a long handle length with the first one being the lack of control that you will have. If something has a long handle then it will be harder to precisely control where the blade of the axe is going to strike. You are able to add more control to this by placing one of your hands further up the handle. Another downside is the added weight that comes from having a longer handle and this too will make the axe harder to pick up and swing. This will require a greater level of strength in order to be able to swing it accurately. The additional weight also makes it less portable and hard to carry around with you. As we said there, the additional weight can make it less portable but obviously the extra length of the handle is going to make it less portable too as it will be harder to carry and store away. With some smaller hatchets you’d be able to place them into your backpack and carry them around but for long axes this wouldn’t be the case. The best length for your handle then is going to depend on what is going to be important for you. It could be that you are looking for something light and portable or it could be that you simply want the axe that is going to be able to generate the most power. This depends on your needs and it could be that you decide to have both a small hatchet and a long axe. While the weight of a handle can have a large bearing on the overall usability of the product, the head is going to be a lot more significant in terms of how you are going to be able to swing it. This doesn’t always depend on the length of the product as the weight of the head will vary from one company to the next. As we discussed earlier, the force that can be placed on an object depends on two factors and that is the speed and the mass. Therefore, the heavier an object is, the more power it will be able to generate if it is swung at the same speed. If you are aiming to cut down larger pieces of wood then this could be an important consideration. You only will be able to get that additional power though if you are able to swing through the blade at a decent enough speed. Getting a hatchet or an axe which is too heavy for you will mean that you won’t be able to use it as effectively. Chopping wood can also be a strenuous exercise and having a heavy product will tire you out very quickly. Due to this, it’s probably a good idea to be a little cautious when it comes to making your decision. If you are going to be making firewood then you would only need to cut down medium sized branches and therefore a heavy product wouldn’t really be required. If you are strong and fit then it’s likely that you’d be able to cope with something bigger. In terms of hatchets, they are generally smaller in weight and will usually weight about one or one and a half pounds. This will make it a lot more portable and also able to be swung more quickly. An axe will often weigh a lot more and usually come in around four pounds which is a significant difference and will require a lot more strength. As well as the ability to swing it quickly, weight also plays an important factor in the portability of it too. If you are going to be moving around a lot then you don’t want to have to carry something which is going to have a significant weight to it. If you are backpacking then you would need a small hatchet which you could easily carry around in your bag. With an axe or a hatchet they often come with either a traditional wooden design or a more modern design. The two will be as equally as effective as each other in terms of striking power but it can often mean that they have a different material on the handle. Here we look at all the different types and how effective they are. Wood – Wood handles are the more traditional type of handle and are often made from hickory which is known for its high level of durability. The handle is often shaped for a good grip with an eyelet in the handle so you’d be able to tie something through and secure it around your wrist. Wooden handles though can’t quite offer the same grip as others, especially in the wet. They will also have the potential to rod over time too. Plastic – Plastic can be a good material to have on a handle even though it doesn’t have the natural levels of grip which other materials can. That’s because it can be textured so that it makes it very difficult for it to slip out of your hand, even when it’s wet. It may not offer the greatest level of comfort though compared to others. Leather – Leather is a great choice of handle as it ranks highly in comfort and the level of grip that it gives you too. It will feel nice in your hands and you will be able to continually strike the wood without getting sore. It also gives you a very high level of natural grip but the one downside would be the long-term durability as the handle could get worn down over time. Fiberglass – In much the same way as with plastic, a fiberglass handle will be able to be textured in order to give you a good grip. Fiberglass is very light too which means that you would be able to swing it at a greater speed. It may not rank the highest in comfort but it will still feel good in your hand. Rubber – Rubber has many similar qualities to leather in terms of having a very high natural level of grip which will reduce any risk of the product slipping out of your hands. The rubber might start to wear away over time though so you want to make sure that it is well made. It is a good choice though as it will feel comfortable to grip. Almost all hatchet or axe heads will be made from hardened forged steel which is the best material due to the fact that it is light enough but will have a high degree of strength to do what you need. That’s the material which has been used for many years and with a great degree of success. In terms of how large the blade should be, this will often depend on what your needs are and the size of the wood that you are intending to cut. This will often have a direct correlation to the length of the handle with the idea that the more power that you are able to generate, the larger the blade need to be. If you are only going to be cutting smaller branches then having a large blade would be a waste of additional weight. Generally hatches will have smaller heads that can be found on an axe as they are usually a smaller product and easier to swing. With the head too, it’s important to use one which is held securely in place and won’t ever come loose. This is where the modern designs often hold an advantage as they will be more molded and held securely in place with their composite design. The best traditional hatchets are very well made though and stay solid for a long time. There are also some heads which are forged from one piece of steel which offers the ultimate in head security as nothing need to be secured. These are highly durable and look great too with the one piece of seamless steel. There are three different design options when it comes to the head it will either have a single head, a double head or a spiked head. The single head is by far the most common type that is used as this will consist of one blade as the front with a blunt edge on one side of it. This will allow you to focus all your power on delivering that large blow. A double head blade will simply have the same design of blade on both sides which makes it look more like a medieval weapon than a useful camping tool. This has the added benefit of having two blades which you would be able to have equal wear and therefore it will last for a longer time but this does drastically decrease the safety of the product as you’ll be drawing the blade back towards you when you are taking a strike. The other option that you can buy is a spiked head on which you have the blade on one side and you will have a spike on the other side which usually resembles that which you would find on a pickaxe. This can be a very useful tool in some scenarios but not really for camping. Like with the two-bladed design, this is also not as safe which is an important consideration. 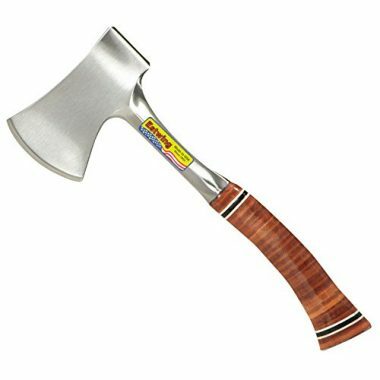 In terms of the design of the actual hatchet or axe, there are three main types and they are wooden, composite or steel. All three types are able to offer you a high level of performance but there are a few differences between the three. A wooden product will be able to give you a more traditional look which many people prefer but the wooden handle doesn’t offer the same level of grip as other options and there is more chance of the head coming loose. With composite products, the handle is often made out of a light material such as fiberglass or plastic which reduces the overall weight of it. There is also less chance of the head coming loose as it will be secured very tightly into its fitting. These are a great option with a handle which is usually textured for added grip. The other option is to have one which has been forged from steel in one piece so the head doesn’t need to be secured to anything. This gives you peace of mind in regards to the safety of the product but it also gives it a high amount of durability too. The extra steel will add to the overall weight of the product so it’s important to see if it will be light enough for you to handle. Other key design features include the way that the handle is shaped. You want to ensure that it isn’t a straight line so that you have less chance of losing control of it. This can be done with a handle which is slightly curved or one which has a lip at the end of it which will stop your hand slipping past. Having an eyelet hole in the bottom of the product is also a good idea for safe storage and securing it to your wrist when it’s in use. The sharpness of the blade is going to play a key role in its overall effectiveness as trying to cut with a dull blade would be a very thankless task and one which would require far more effort than you should have to expend. You want to make sure that the blade is made from hardened steel as this will help to ensure that your blade will stay sharper for longer. It’s a good idea at this stage to look at the user reviews on a product to see what people are saying about it and if there are any complaints about how quickly the edge starts to get blunt. It’s important to inspect the sharpness of the blade after each trip to ensure that it’s still as sharp as it should be. If it’s not then it will need to be sharpened before you next head out there to use it. The effort that it will take to get the blade sharpened will be more than worth it to avoid the extra effort that you will need in order to cut wood with a dull blade. If you are carrying around an axe or a hatchet with you then having a sheath or a cover over the blade is going to be vitally important to add to the safety of the product when it is not in use or if it is transportation. This means that you would be able to move it around with a lot more confidence and not having to worry about getting hurt. These can come in a few different materials which can all do a good job in protecting the blade. The more traditional looking products with the wooden handle often comes with a leather cover which looks great when it is placed on the blade and is definitely the most stylish option but also one which is going to be highly effective in preventing injury. Another popular option is to have a nylon sheath which may not sound like the greatest material on the face of it but it is as tough as any others as the material is very thick and able to stop to the blade from damaging anything if it’s covered. With composite products they will often have a plastic cover which will be extremely good at protecting you from any injuries as the hard plastic won’t be broken by the blade. A useful addition to these types of covers is that they often have a handle on them which makes them a lot easier to carry to wherever you need to go. Q: What Is A Hatchet? A: A hatchet is designed as a small axe so it usually has a much shorter length than other chopping options. Sometimes the terms axe and hatchet can be used quite interchangeably so it can be confusing to know exactly what the definition is, as there are no specific lengths which separate the two. A hatchet is generally used for smaller job due to its size which as cutting off branches and other pieces of small wood. This lack of size often makes it a lot more portable but often it lacks the power of the other types of product that you can find. A hatchet is ideal for anyone who doesn’t want to expend the energy which is required with a longer and heavier axe as it will take a lot less effort for you to swing a hatchet. It’s also a better option for those looking to backpack as a hatchet wouldn’t be too heavy and could fit in with your other items. Q: What Is An Axe? A: An axe is simply a blade which is attached to a long handle for it to be used for heavy chopping tasks such as cutting down trees or other large pieces of wood. The generally just have the single use and need to be used with two hands due to their size and weight. Their greater size gives them a lot of cutting power as you can get a lot more speed and momentum through your blade. This will mean that just with a few swings of your blade you will be able to cut a lot into whatever you are trying to take down. This larger size naturally makes them a lot less portable than a hatchet so you wouldn’t be able to take them with you if you were backpacking, for example. An axe though is going to be ideal if you are in need of more cutting power and if you don’t have to worry too much about having to carry it for any great distances. Q: What Is A Tomahawk? 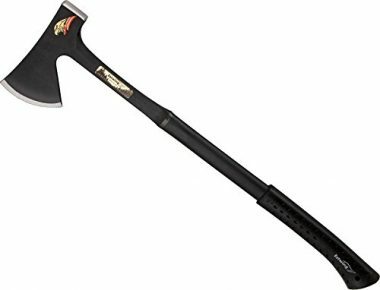 A: A tomahawk was invented primarily as a weapon to either be used in hand-to-hand combat or thrown but these days they are used in much the same way as a hatchet it and can be used for small cutting jobs and other similar uses. One of the biggest distinguishing factors is that the tomahawks are usually a two-sided weapon with one side having a sharp blade and the other side generally having a blunt edge in order to smash things with so could be used for a variety of different tasks. Q: What Is The Difference Between An Axe, A Hatchet, And A Tomahawk? A: The three of them are very similar today but there are a few key differences. An axe is mainly used as a means to chop down large pieces of wood and a hatchet is just a smaller version of that. A tomahawk was invented solely as a weapon but these days is used in much the same way as the other two. A tomahawk blade will often be styled in a much more aggressive way and you might see holes cut in the blade in order to reduce its weight while keeping its strength. You’d never see such features in an axe or hatchet as they will be one piece of solid wood. You can get long handled tomahawks which look very similar to an axe but with the two-headed design that can come with a tomahawk. In many ways a tomahawk is in the middle between a hatchet and an axe. They can have longer handles than can be found with a hatchet but with a head which is generally not as heavy as an axe. 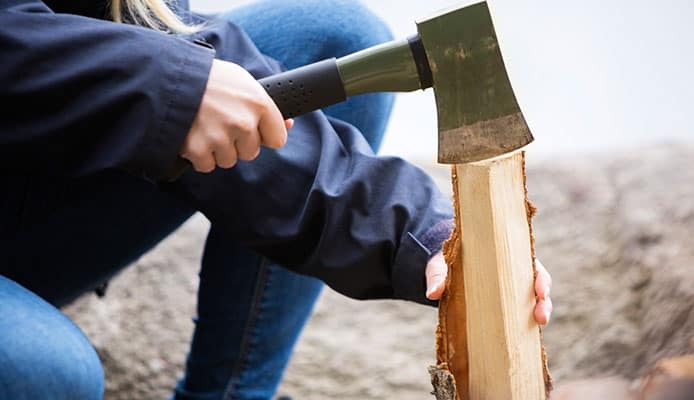 Having an axe or a hatchet can make your camping trip a whole lot easier and could end up being a vital piece of equipment in much the same way as getting the best fire starter or having a brilliant multi tool with you. There are certain items that will make your camping experience even easier and getting a hatchet or axe falls into that bracket. In order to choose the right one, you need to assess your situation and what your needs are going to be. If you plan on backpacking then it would be the best idea to get a smaller hatchet which you would be able to fit into your bag and take with you wherever you go. 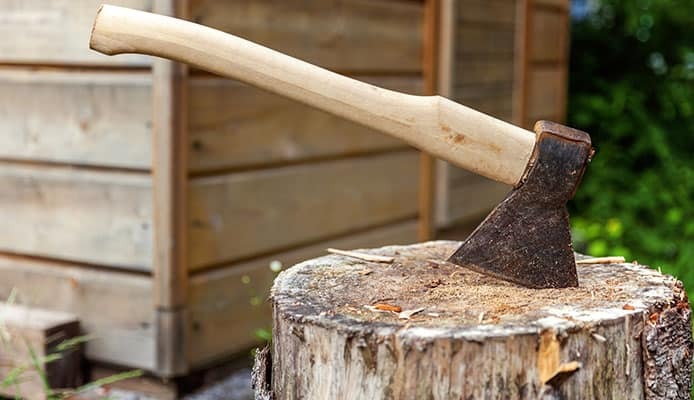 If you are at a more permanent camp though, having a full-sized axe might be your best bet in order to cut that firewood up quickly and efficiently. The length of it will play a crucial role in your buying decision as you need to determine what you will be able to carry and how you will be able to transport and store it. The length though does determine the amount of power that you can get from the swing but then that will also increase the weight too and you have to decide how easily you will be able to swing a heavy blade. There are a few different designs when it comes to this product but they are all highly effective at doing their primary task. Some people prefer the more traditional look of a wooden handle whereas others will be happier to go with a more composite, modern design. This is generally down to personal preference, as is the choice of material on the handle. Hopefully this guide has answered all your questions in regards to which axe or hatchet you should buy. They are great products and make for a very useful camping tool. When you choose the best one, you’ll be able to head out to camping and clear the area and create that firewood more easily than ever before.